Fight over kin selection on its 50th anniversary: W.D. Hamilton’s Aunt Prudence. What Are Relatives Good For? The battle over every aunt and uncle’s favorite evolutionary theory. 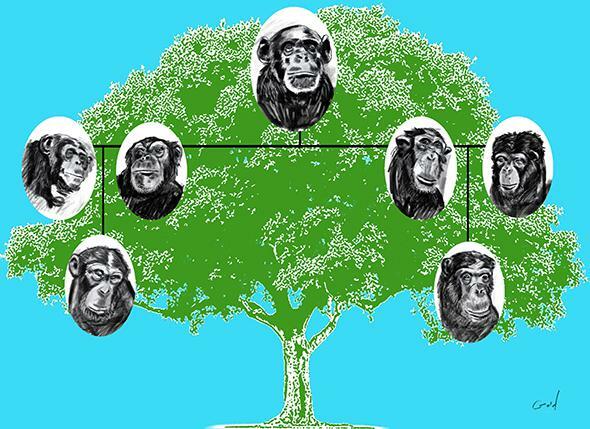 A battle is being waged over kin and kind: Did cooperation evolve in humans and other animals because it helped relatives? Or because it promoted group living? A school of thought known as inclusive fitness theory—or kin selection—sits at the center of the conflict. Most biologists consider it to be the leading explanation for the evolution of cooperation and altruism. But one of the most famous evolutionary biologists in the world, Edward O. Wilson, has challenged the concept and published a book promoting group selection as a replacement. He’s probably wrong, but his book may have reached more people than any scientific publication about cooperation since kin selection was proposed 50 years ago. What does looking back tell us about the way forward? Evolutionary history might have taken a very different path if it weren’t for an act of Prudence. In 1955, Lance Cpl. Bill Hamilton was still a decade away from the kin selection publications that would establish his reputation as the “most distinguished Darwinian since Darwin.” The budding scientist was brash, insubordinate, and fiercely individualistic. He was trapped in a two-year compulsory service for the British army and disgusted with the hierarchy and regimentation of army life. He was estranged from his family—aside from a distant relative who would reveal how kinship meant far more than just a family tree. Young Hamilton found sanctuary by visiting his Great-Aunt Prudence, his mother’s mother’s sister, as often as he could and reading from her extensive library on natural history. Aunt Prue, as he called her, was an avid beetle collector who had never married or had children. She saw in her young nephew a means to pass something of herself along. Prue encouraged his interests and offered Hamilton her entire insect collection as well as her complete library as a gift to promote the advancement of his studies. One book in particular, a work by the French entomologist Jean-Henri Fabre, excited Hamilton’s imagination with its descriptions of insect behavior. Life as we know it would never be the same. In 1964, while still finishing his Ph.D. at University College London and the London School of Economics, W.D. Hamilton published a pair of papers entitled “The Genetical Evolution of Social Behavior.”* This work introduced kin selection, one of the most important advancements in evolutionary biology since population genetics. In a single concept, Hamilton had explained complex behaviors extending from ant colonies to primate grooming to why great-aunts should invest in their nieces and nephews. The papers have had a huge impact in the 50 years since they were released, and the Philosophical Transactions of the Royal Society has now published a special edition to commemorate the anniversary of this achievement. Hamilton’s key insight was that, because related individuals—kin—share more genes in common with one another than they do with nonkin, natural selection should promote behaviors that help one’s family members survive and reproduce. Under certain circumstances it would even be more advantageous to forego reproduction altogether and instead help the children of close relatives. This idea would be encapsulated by the line attributed to British biologist J.B.S. Haldane: He would gladly risk his life for two brothers or eight cousins. Genetically speaking, the math is the same. Hamilton’s theory followed up on something Charles Darwin described in 1859 in On the Origin of Species: “Selection may be applied to the family, as well as to the individual.” For Darwin, the issue of evolutionary selection above the level of the individual was crucial for understanding the basis of the moral instincts. “In the case of the lower animals it would be absurd to speak of these instincts as having been developed from selfishness,” Darwin went on to write in The Descent of Man. Family values, and even solidarity at the level of entire communities, were integral parts of our evolutionary inheritance. Hamilton devised an elegant equation (rB > C) that predicted whether an animal—such as an insect, a chimpanzee, or even his Aunt Prue—would engage in a behavior that helps another animal. The equation simply states that the individual should be willing to accept a cost (C) to itself if the benefit (B) to its relative was high enough, taking the extent of their genetic relatedness (r) into consideration. Selfless behaviors would occur spontaneously because those who had engaged in them in past generations had better relayed their shared genes on to the present via the success of their kin. What’s more, Hamilton’s equation for kin selection could also predict one of the issues that had plagued evolutionary biologists ever since Darwin: the altruism displayed by sterile workers among the eusocial insects such as ants, bees, and termites. In a single equation Hamilton had solved a major mystery and proposed a solution to how the building blocks of morality had evolved. However, in the past few years there has been a turf war among what are otherwise normally collegial scientists over the legacy of Hamilton’s theory. The esteemed Harvard biologist Wilson has challenged kin selection in favor of the more expansive theory known as group selection. Afterward, there was a firestorm of criticism and an unprecedented joint letter to the journal Nature—signed by 137 scientists—supporting the utility of kin selection theory. This was accompanied by angry denunciations of Wilson as a scientist by some of the top researchers in the field. The current special edition of Philosophical Transactions devoted to the importance of kin selection must be seen in this context. Darwin can be called in to support either side of the conflict—what they’re really arguing about is Hamilton’s legacy. What ultimately matters in such cases are the predictions a theory makes that can be substantiated through empirical tests. When all is said and done, for a scientific theory to be taken seriously, you need to shut up and lay your cards on the table. While those who advocate group selection offer evidence gathered under certain laboratory conditions, there is no question that kin selection has been enormously productive during the past 50 years. (I argue that the fight is largely unnecessary and that the two theories are compatible.) As this week’s commemorative retrospective demonstrates, kin selection theory has offered repeated insights into the insect communities that originally intrigued Hamilton, and the theory has extended into the areas of infectious disease, parasite-host interactions, and even agriculture. Ultimately, kin selection has a prestigious history and is still inspiring fresh science in ways that W.D. Hamilton could never have anticipated. Any suggestion that the theory should be abandoned is currently misguided. Hamilton’s insight revealed that evolution operates at multiple levels of selection simultaneously. It is a fitting tribute to the 50th anniversary of his work to know that it was a distant relative who ultimately promoted his success even though it offered nothing to her personally. It is a strategy that individuals in many species choose to adopt based on the life history options available to them. Prudence died in 1958, six years before the publications that would ultimately make her nephew famous. There is little doubt that the choice Aunt Prue made to help her young relative resulted in benefits both for her kin and for the scientific community.